The International Maple Syrup Institute quarterly Board of Directors Meeting was hosted by the Vermont Maple Sugarmakers’ Association on Thursday, May 8th, 2014. 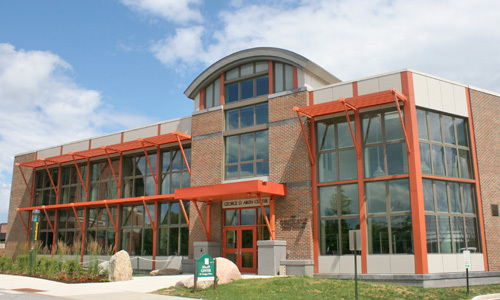 The meeting was held at the George D. Aikens Forestry Sciences Laboratory in the same meeting room that was used for the first meeting of the people responsible for the establishment of the IMSI, which was formed officially in 1975. This is a reminder that in 2015 it will be 40 years since the IMSI was established by maple industry leaders from the United States and Canada. The May 8th meeting was very well attended by IMSI Directors, IMSI Advisors and others with an interest in IMSI business affairs. This summary is being provided in advance of more detailed formal minutes, which will be distributed at a later date. Denis Lejoie replaced Jerry Kless as IMSI Director representative for Citadelle Cooperative. A listing of the 2014 IMSI Board of Directors is posted on this website (click here). IMSI Treasurer David Campbell presented a quarterly financial report outlining revenues and expenditures to May which was accepted by the IMSI Board without amendment. Since the February 4th IMSI Board of Directors meeting, US and Canadian Bank accounts were opened to accommodate the change in IMSI Treasurer which came into effect January 1st, 2014. IMSI Treasurer David Campbell updated the IMSI Board regarding the status of the IMSI Membership Renewals. Most IMSI members from 2014 renewed their membership for 2015 and there are a few new members this year. Those IMSI members who have not yet renewed their membership for 2014 are encouraged to do so. Dave Chapeskie, Mark Harran and Richard Norman have been involved in some outreach activities to encourage the State Maple Associations which are not yet members to join the IMSI. These States are Minnesota, Pennsylvania, Indiana and Rhode Island. Mark Harran offered to attend upcoming Maple Association Meetings in Pennsylvania and Indiana to raise awareness regarding the value of IMSI membership. The IMSI is currently registered with the Canadian government with a Not-For-Profit Corporate status. The Registration of the IMSI in the US lapsed in the early 1990’s In 2014, it is necessary for Not-For-Profit Corporations to re-apply for Registration in Canada and the Application must be approved by the Canadian government by October 2014 at the latest in order to maintain the IMSI Corporate Registration status. Based on discussion at the Board meeting on May 8th, a Board motion was passed to pursue re-instatement of IMSI Registration in the US. Dave Chapeskie will lead follow-up on the Canadian IMSI Corporate Renewal and David Campbell will lead follow-up on the US Corporate Renewal. Steve Selby and Mary Jeanne Packer will serve in an Advisory role to assist this work. IMSI President Yvon Poitras called on representatives from all States and Provinces in attendance to provide preliminary maple syrup crop reports for 2014. What is common across the maple industry is that the production season got off to a late start with syrup production not starting in many areas in both the United States and Canada until near the end of March. This late start was unprecedented in some areas. However, once production was underway there were very good sap runs in a more compressed time frame, particularly where sap runs were assisted by high performance vacuum systems. Sap runs were well below normal in most cases where buckets were used. Yields were generally higher in northerly and higher elevation areas since warmer weather tends to be delayed in these areas allowing for a long season,despite the late start-up.. Reports at the meeting suggest that the yield of maple syrup in the United States could be as high as 95% of the 2013 yield and in Canada the yield could be 80% or more of the 2013 crop. Overall, it is expected that there will be a sufficient supply of syrup to meet market demand in North America and overseas. It is important to note that official maple syrup yield statistics are not yet available. Simon Trepanier, Director General of the Federation reported that from January to April of 2014, 10 million pounds of maple syrup was sold from the Federation’s Strategic Reserve of 66 million pounds. The Members of the IMSI Market Study Group held their first meeting in Burlington, Vermont on Wednesday, May 7th. Mark Harran leads this study group and Dr. John Garwood facilitated this meeting. Other members of the group in attendance were David Marvin, Emma Marvin, Michael Farrell, Matthew Gordon, Ray Bonenberg, Dave Chapeskie and Simon Trepanier. Yvon Poitras, Richard Norman, David Campbell and Mary Jeanne Packer also attended the meeting. Mark Harran provided the IMSI Board with an update from the Market Study Group meeting. The objective of the study group is to develop goals, strategies and guidelines to help advance markets for pure maple syrup in North America. The draft output from this initial meeting of the group is appended to this IMSI Board meeting summary. They will be meeting again on Tuesday, August 5th from 8:30 to 12:00 noon EST at the Ambassador Hotel and Conference Centre in Kingston, ON (site of the IMSI Board of Directors Meeting). They will also complete some preparatory work for the meeting between now and then. Simon Trepanier provided an update at the meeting regarding a Federation of Quebec Maple Syrup Producers initiative to encourage the use of pure maple syrup over other syrups in restaurants. This initiative is designed to encourage restaurants to serve real maple syrup. IMSI Vice President Mark Harran led a discussion regarding a letter which the IMSI Executive Committee authorized be sent to the US Farm Appropriation Committee leadership. The thinking behind the letter was to encourage an Appropriation of Funds for the US maple industry and to help ensure that support for marketing would be included in an Appropriation mix. It was not intended in any way to underplay the importance of production related programs which tend to be emphasized in the political domain. A number of State IMSI Directors and the Director of UVM Proctor Maple Research Centre expressed concern about the letter and felt that the IMSI should not engage in this manner on behalf of their U.S. membership. The IMSI Executive Committee believed that the letter was issued in the best interests of the North American Maple Industry with no downside. However, some IMSI members who attended the meeting did not share this view. Moreover, They felt that there should have been broader consultation with IMSI members before the letter was released and that there was no urgency in issuing the letter. Despite divergence in opinion regarding the letter,It was decided that it would not need to be withdrawn. The letter prompted some discussion on the need for a coordinating body or alliance comprised exclusively of US IMSI members, similar to the Canadian Round Table,to provide a coordinated U.S. based and focused collective voice to the US Congress and USDA regarding matters of funding, policy, etc. The IMSI has sent out a first batch of letters to companies that are selling one or more products believed to contain no real maple syrup and where product names or labels are thought to be misleading to consumers. While the letter expresses concern, the letters are also intended to open the door to the possibility of having at least some of these companies switch to using pure maple as an alternative to artificial flavors or other syrups. The IMSI government advisors in Canada and the United States have been apprised of the letters issued to-date and will be made aware of any responses received from companies. The IMSI will also be inputting into proposed label Regulatory amendments at the federal level in Canada as well as collaborating and sharing information with others ,including the State of Vermont, who are engaged in helping address the product label misrepresentation issue. Since the IMSI Board of Directors meeting in 2014, the IMSI facilitated testing of one syrup product thought by the contributor of syrup samples to be adulterated. Samples were sent to both Centre Acer and University of Waterloo laboratories for testing. The findings from the laboratory tests were assessed following the IMSI Board meeting on May 8th and the results were both negative (i.e. the syrup was not determined to be adulterated). John Kingston of Butternut Mountain Farm provided an update regarding status of this issue. Details are confidential. Kathy Hopkins, Chair of the IMSI’s Organic Certification Committee, was unable to attend the IMSI Board meeting. Dave Chapeskie, assisted by Mark Harran, led the discussion. The IMSI’s Organic Certification Committee prepared a short draft statement comparing Certified Organic Maple Syrup with Non-Certified Organic Maple Syrup. Once approved by the IMSI Board of Directors , the final statement will be provided to IMSI members to help them address this question in an informed manner without having to spend time researching the difference eliminating the possibility of inconsistent messaging . The final draft of the statement from the IMSI Organic Certification Committee is appended to this meeting summary . The Organic Certification Committee will now work to identify some of the very specific differences between Certified Organic and Non-Certified Organic Maple Syrup in comparison with non-certified organic best practice and quality assurance manuals. The value of having quick access to this information is that it could be referenced by the IMSI leadership in future discussions with maple researchers, government officials and certifying bodies. Targeted research (i.e. best maple tapping guidelines, defoaming agents, etc. ), combined with industry input into certification amendments, could further narrow any gap between Certified Organic and Non–Certified Organic Maple Syrup. The IMSI has been engaged at the political level in both Canada and the United States in an attempt to expedite approvals at the federal levels. On May 7th, 2014, the United States Department of Agriculture (USDA) posted the USDA maple grades regulatory amendments in the Federal Public Register for a 60 day comment period. A similar posting for a 75 day comment period in the Canadian Federal Gazette is expected soon. Vermont has implemented the new maple grade standard for the 2014 production season while we remain hopeful that the federal and other state/provincial governments with maple regulations will approve the new standard for implementation in 2015 where they have not already done so. It is noteworthy that the Vermont Maple Sugarmakers’ Association produced 5000 temporary colour classification kits aligned with the new standard , Centre Acer has produced a Kit and Lovibond International is very close to releasing a new Lovibond permanent colour classification kit aligned with the proposed International Grade Standard. The IMSI Executive Director and IMSI Maple Grades Committee members continue to address questions from maple producers, maple packers , government officials regarding grade and nomenclature changes.. There have also been a significant number of Press inquiries regarding the new maple grade standard in recent months. Dave Chapeskie, Henry Marckres and others have been responding to Press inquiries. The IMSI Executive Director has now distributed the North American Position Statement Paper for Asian Longhorned Beetle to political and government officials in both Canada and the United States so that it can be put to work for the industry. Further distribution may be completed later as required. The IMSI will continue to offer the Lynn Reynolds Memorial Leadership Award and the Golden Maple Leaf Award in 2014. The IMSI Award Guidelines were distributed to the IMSI members early in 2014.All nominations for the two awards must be received by the IMSI Executive Director no later than August 31st, 2014. IMSI members are strongly encouraged to submit nominations for who they believe are worthy recipients of the awards. Members should contact Dave Chapeskie,if they have any questions . There will be dialogue in 2014 regarding opportunities to extend the reach of the Grading School in Canada and the United States and to work towards a more uniform approach to maple grades awareness and education in North America. This effort will help assist implementation of the new international grade standard for maple syrup. Yves Bois, General Manager, Centre Acer provided an update regarding recent maple grading program offerings in Quebec. Follow-up dialogue between Centre Acer and those responsible for designing and offering the IMSI Sponsored Grading School is very important along with an assessment of other state /provincial level training offerings in Canada and the United States. A 2014 Maple Grading School offering has been confirmed for Monday, October 21st and Tuesday, October 21st at the Old Orchard Inn in Wolfville, Nova Scotia. Another one day compressed grading school designed for Canadian and US government officials with a primary focus on the new standard grading system may be offered earlier in the year with the location and date yet to be confirmed. Once confirmed, all IMSI sponsored Maple Grade School offerings are posted on the above website. If additional information is required please contact Kathy Hopkins at 207-474-9622 or khopkins@maine.edu. The 2014 Annual IMSI and NAMSC Meetings will be held from Wednesday, October 22nd to Friday, October 24th – Old Orchard Inn, Annapolis Valley, Nova Scotia. The IMSI Annual meeting will be held on Wednesday, October 22nd. Overall program details are posted on the website (click here for more details). The Conference planning committee in Nova Scotia is targeting to have the Annual NAMSC-IMSI Registration package ready by June 1st.